Haven’t nailed down your Valentine’s Day plans just yet? 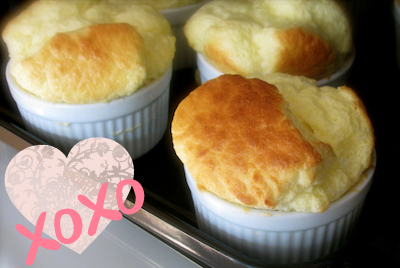 Show your sweetheart how much you care with a homemade brunch to remember. This gourmet recipe for cheese and herb soufflés with sautéed mushrooms will make you look like a seasoned chef and is sure to warm your darling’s heart. As with any recipe, this one is best when prepared with super fresh organic eggs and chemical free produce available for delivery if you’re a Passanante’s Home Food Service customer. Feel free to make these in advance as they will keep for up to 24 hours in the refrigerator without the topping. Garnish with sautéed mushrooms and serve right away. This entry was posted in Recipes, Sides & Salads, Vegetarian and tagged brunch, Food Delivery Service, Passanante's Home Food Service, Recipe, souffles, vegetarian brunch by Passanante's Home Food Service. Bookmark the permalink.